E-commerce giant Amazon has announced it will install large-scale solar panels on the roofs of 50 of its fulfilment centres around the world. 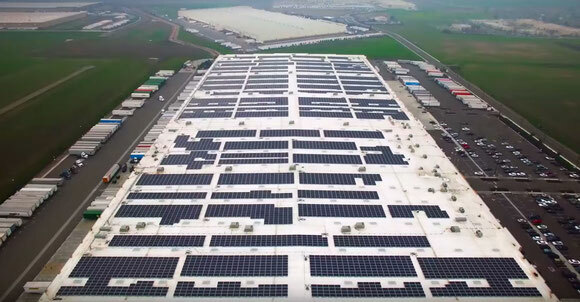 The first solar panels will be placed on more than 15 fulfilment and sortation centres in the U.S. this year, while 50 facilities will be installed globally by 2020. Depending on the project, time of year, and other factors, Amazon said the solar panels can generate up to 80% of a fulfilment centre's annual energy needs. The company has a network of wind and solar farms in Indiana, North Carolina, Ohio and Virginia. Its largest wind farm to date is in Texas. The initial solar projects planned for completion by the end of 2017 will generate up to 41 megawatts (MW) of power at Amazon facilities in California, New Jersey, Maryland, Nevada and Delaware. In another development, the logistics arm of Amazon India, Amazon Transport Services, has reduced payouts to corner stores that double up as delivery partners, mainly to control costs and consolidate its network. The stores act as pickup points, receiving deliveries on behalf of Amazon's customers. Amazon started the corner store project as a pilot scheme in 2015 to increase its logistics reach in India. At the moment nearly 13,000 stores across 65 cities are part of the network. The company now wants to consolidate the network because of the huge costs associated with managing this vast network of stores. One store owner in New Delhi was quoted as saying that as a result of lower payouts per package, Amazon is forcing stores with lower densities to pull out.